Choice of one piece individual or flat sheet. If you are looking for 4 or 5 pcs sheet set, please go back to Silk dream section where they are both available. Made of top quality heavy 19 momme weight (if the weight is less than 19 momme, the silk is too thin for sheets, if it is higher than 19 momme, it is too thick and too expensive) pure mulberry silk. The sheets are seamless and hemstitched.Fitted sheets have 15" pockets to accomodate mattresses up to 17" deep. Machine washable in cold water and machine dryable using delicate cycle, no bleach. 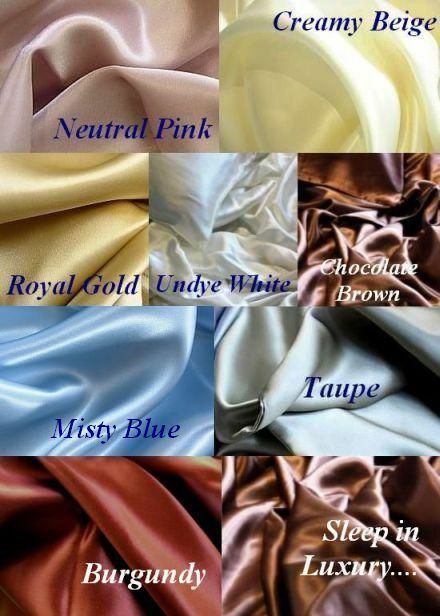 Not only our Grade A 19 momme charmeuse mulberry silk is of a much better quality than most silk sheets on the market which are mostly 15 momme habotai silk. (Unlike cotton where the quality is measured by thread counts, silk quality is measure by the weight, the higher number momme the better) it is much cheaper too because as a direct importer we cut off the middle men and offer direct import price to you. Almost all silk bedding etailers went through wholesalers and distributors, that is why their price is more than double of ours. The sheets are on Sale now, don't wait as price of silk is going up! Shipping is free for all US customers! All silk sheets will be shipped fully insured and signature required. If you do not want signature required, please specify on note when placing order. Silk sheets are comfortable both in Summer and in Winter. In Summer, not only do they feel cool in touch, they wick away the moisture from your body and in winter, they gently form to your body, eliminates air pockets and retain your body heat which keeps you warm, Once you have tried silk for bedding, you will never go back to cotton. A true luxurious pampering item.